I’ve been involved in sport rocketry since about 1980, beginning with Estes model rockets. Later I began using larger black powder motors from Flight Systems, and some early composite motors. In 1987 I became involved in “high power” rocketry, with access to even larger motors. I’ve always been fascinated by the concept of putting a camera on board a rocket -- it’s the next best thing to actually riding a rocket. 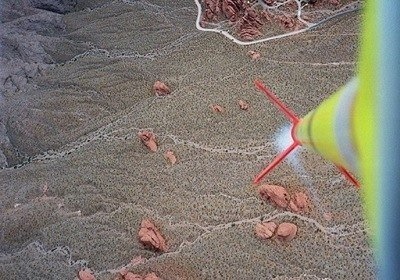 At first I experimented with the Estes Astrocam, a model rocket with a simple 110 camera built into the nosecone. This camera would shoot one frame per flight, looking forward after apogee. A bit tame, with little control of the image. When I started using larger motors, I built a custom payload using a cheap plastic 35mm camera with a jerry-rigged mechanical timer. This too only shot one frame per flight, but the quality was better and more importantly, it was looking back towards the tail of the rocket during flight. The resulting images showed the fiery exhaust and smoke trail streaming from the rocket as the ground dropped away -- much more exciting! Later I switched to a second-hand Ansco brand motorized camera that could shoot a series of photos during the entire flight. It produced even better photos but was susceptible to high G’s. Around that same time I discovered a brand of Super 8 movie camera that was perfect for rocketry. The Bentley cameras were simple, inexpensive, lightweight and easy to modify. They could be cut down small enough to fit into a rocket powered by only an “F” class motor. They were also sturdy enough to handle the flight forces produced by much larger motors. I’ve made well over 200 flights with these cameras using a wide variety of rockets, configurations and motor types. I also used some of these Super 8 cameras to shoot some spectacular close-up, slow motion liftoff footage. In February 2000 I was getting tired of Super 8, and wanted to do more 35mm aerial photos. The Ansco camera I’d used before was destroyed in a crash, so I started looking for a new camera. Fellow camera payload specialist Doug Gerrard recommended the Olympus Stylus Epic. I’ve been using these ever since. Small, light, and tough, these great little cameras are perfect for rocketry. They have a fast lens, shutter speeds up to 1/1000th, and are reasonably tolerant of G forces. They can also be easily modified for use with an electronic timer. I’ve shot hundreds of fantastic aerial photos with these cameras. In recent years I’ve also made a few flights using an onboard, live video system from BoosterVision. I have been a member of the Tripoli Rocketry Association for over twenty years, and occasionally fly at club launches and events. I’m also a past member of the National Association of Rocketry. However, most of my rocketry activities are conducted at private launches unaffiliated with any organization. Safety is my number one priority! All necessary steps are taken to ensure that my rocketry activities are safe at all times and do not endanger people or property. If you fly rockets, please do it safely. Contact your local rocketry club for information about rules and regulations affecting rocketry. This page updated March 6, 2008. LEFT Aerial photo of pink sandstone rocks in Nevada. 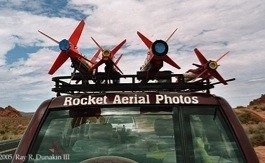 BELOW I often transport my larger rockets on the roof of my Trooper. 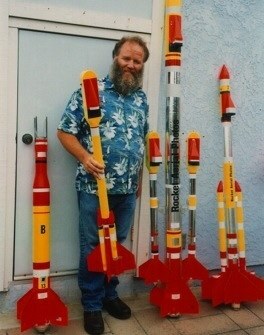 BOTTOM Me with a few of my rockets in 2004. Amazing in-flight photos available for purchase! Tips on building camera payloads. Rocketry booklets and magazine articles I’ve written. Some of the many rockets I’ve built and flown. Some of the ways I build and fly rockets with multiple stages. Here’s a launch pad that’s dirt cheap, easy to make, and easy to use. Can handle anything from small models to 4” diameter high powered monsters! Exciting images of rockets blasting off! Night launches, too! How I built carriers for large rockets. Photos from a national high power rocket launch. The first and finest national organization for high power rocketry! (Small rockets are OK too!) Find clubs and launches near you. Another national organization supporting model and high power rocketry! Find clubs and launches near you.